C11S3CD9 Picking random CD’s to listen to takes me on a number of different journeys, sometimes it makes me wonder why I bought the CD in the first place, others make me want to but more music by the artist and like this CD some take me on a journey to play all the other CD’s I have by the artist. I had forgotten how much I Liked Grand Drive, I hadn’t forgotten how much I loved Danny George Wilson one of the mainstays of the band as I am continually playing the music of his latest band Danny and The Champions of The World, but picking this album made me release just how long he had been releasing top quality music! 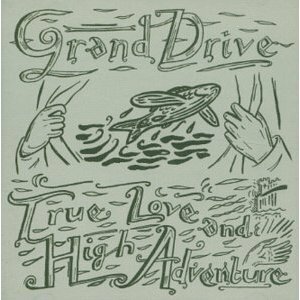 Grand Drive were formed by Danny and Julian Wilson, Australia born, raised in London but playing music straight out of America. Their debut was released in 1998 Road Music to critical acclaim and this album followed in 2000 and took up where their debut left off, beautiful Americana, tight harmonies and nods towards the wonderful music produced by the Laurel Canyon musicians in the 70s and 80s. The album opens with the track Wheels which seems to skip along as if you are in a driving route 66 in an open top Cadillac. Beautiful harmonica seems to give you a back drop of open roads and big sky country. I could write about every track Ladder To The Stars I know means an awful lot to @dazlee1 and truly is a wonderful song. My favourite track is Nobody’s Song in Particular a song packed with emotion and urgency which is just beautiful. It mystifies me why Danny Wilson hasn’t managed to get the recognition he deserves, his music with Grand Drive was first class, and in fact a compilation of rare and unreleased tracks, Being Alive – Loose Wheels and Latchkeys 2000-2005 is so good I would class it as my favourite Grand Drive albums, his solo album The Famous Mad Mile contains one of my favourite ever tracks (Painted Pebbles) and with Danny and The Champions of The World he has one of the best live bands out there at the minute. I have been lucky enough to see Danny play on a number of occasions across all his bands and will again be seeing him in September and as some of you know I’m only trying to see bands that I haven’t seen before this year but such is the draw of Danny and The Champs live show I have to break my rules for them! A beautiful album full of beautiful songs from an artist that makes beautiful music no matter what the bands called.